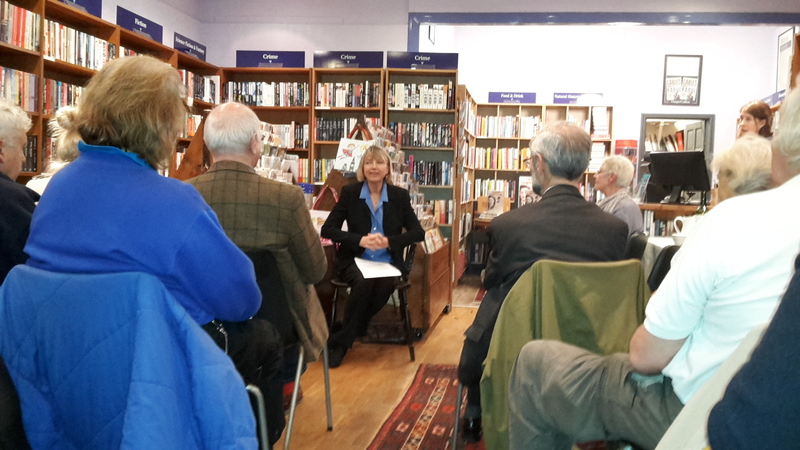 Blogs on publicity events and snippets from recent coverage of Sue and her books. Yesterday was the 50th anniversary of the 1966 Aberfan disaster (see previous post) and my book about the tragedy with TV partner Steve Humphries and life partner Bevan Jones was published by Grosvenor House a few weeks ago. Steve’s wonderfully moving documentary, Surviving Aberfan was shown on BBC4 the previous evening and can be viewed on iPlayer here. Former Mayor of Merthyr and Aberfan survivor Jeff Edwards, the last child to be pulled out of the slurry and rubble alive, was kind enough to write our Foreword. But he amazed us this week by telling us that he would be presenting a copy to Prince Charles on his formal Royal visit to Aberfan yesterday to mark the anniversary. Photos of the occasion have been promised! Jeff – who has met both the Prince and the Queen on several occasions – had already sent a copy to the Queen, who has always shown a special interest in the people of Aberfan. So we can now claim two firsts for our humble self-published book: the BBC logo on the front and knowing copies are now gracing royal bookshelves at Clarence House and Buckingham Palace. Let’s hope they don’t notice the egregious typsetting error on Page 1 of the Acknowledgements. In fact that was one of few hiccoughs with Grosvenor House. In general they pulled out all the stops for us to get the books in shops and on Amazon in good time for the anniversary and all the media attention we knew it would have. Their admin people Tamsin, Ruth and Jackie worked hard for us and so we can recommend GHP with confidence. Not cheap, but so long as your instructions are clear they deliver. I’m shocked and appalled to discover that it’s been five months since the last post – but I have the best of excuses. I’ve been writing. This one crept up on me and then it took over… but it has been a unique privilege and one I wouldn’t have missed. 50 years ago a coal waste tip fell on a school in the Welsh mining village of Aberfan, killing 116 children. This is Aberfan. 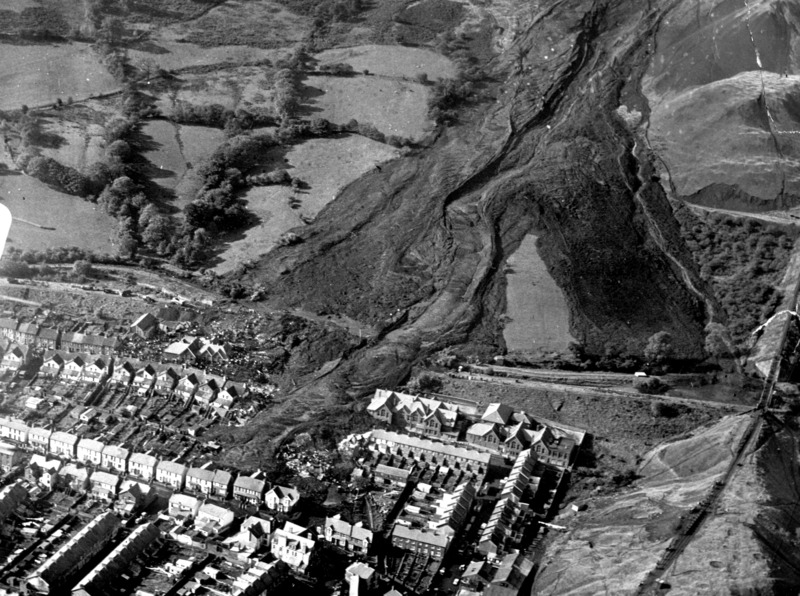 In October 1966 thousands of tonnes of coal waste and rubble fell down a mountainside onto a primary school in the Welsh mining village of Aberfan. 144 people were killed – 116 of them children. Most of them died in the school. It was one of the worst peacetime disasters in Britain in living memory. As a 15 year-old I remember seeing those terrible black and white TV pictures live from the scene and those images have stayed with me. But what about those directly involved? The stories of the handful of children pulled from the rubble, the rescue teams and the parents who lost children are harrowing and heart-breaking enough, but how they survived the years that followed is instructive and often inspirational. When a book to mark the 50th anniversary of the disaster was first mooted – again in collaboration with a Testimony Films BBC commission – I was enthusiastic but it seemed a long-shot. Potential interviewees for the documentary were initially reluctant to come forward, and for entirely understandable reasons. Retrieving painful memories of a tragic time – and for the cameras – is a big ask. The project stalled and at one point seemed doomed. Only painstaking work by the production team and vital mediation by an influential community leader broke the deadlock. Suddenly the TV documentary – and the book – were back on. Just one logistical challenge: to meet the anniversary date 27 long audio interviews had to be transcribed and turned into a 50+k book in a matter of two months. Needless to say, it is done. The story of how it happened and how it will eventually get published will appear in due course elsewhere on this site, but suffice to say as I write that the manuscript is delivered, photos have been captioned and the cover designed. Sweat and logistics aside, I’ve been privileged to live in a world of Welsh voices telling their stories – both sad and uplifting – for the past 6 weeks. I have never met these people yet I feel I know them. If I’m lucky, I might yet get to meet some of them. In the meantime I hope – with my co-authors Steve and Bevan – to have done them and their experiences justice. I know Steve’s documentary has. Now the book needs to do the same. Surviving Aberfan: the People’s Story published by Grosvenor House. Surviving Aberfan BBC One in Wales, BBC Four in the rest of the UK. Tx tba. Launch sellout at Pitshanger Bookshop! Last night I Heard My Country Calling was officially launched at my lovely local bookshop in Pitshanger Lane, Ealing. This was an open event, not a luvvie publishing party – and all the better for it. Only about half of the 40 or so people there (it’s a small space so it felt packed to the gunwhales) were friends, neighbours and people I’d press-ganged to come. The rest, miraculously, came of their own accord on a dark, damp November evening. 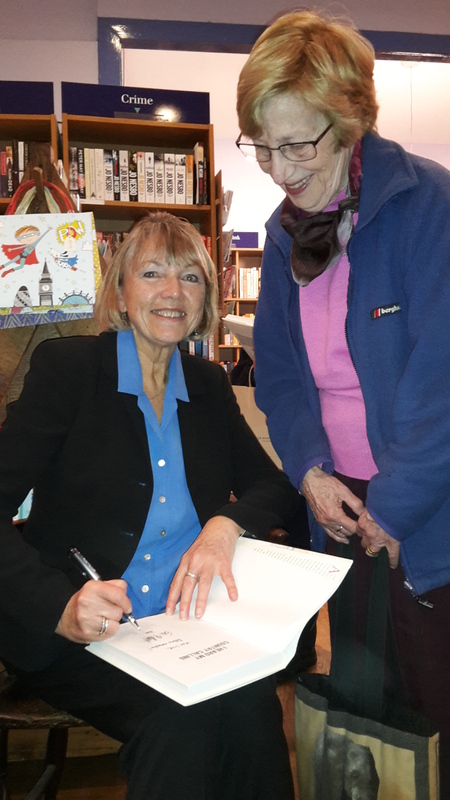 Pitshanger Bookshop owner Fiona Kennedy gave me such an enthusiastic introduction – she’d read the book and seemed genuinely to have loved it – that I launched on my little talk and readings on a high. I don’t get much chance these days (or, frankly, for the past 40-odd years) to make use of my Drama training, but I gave the readings welly and did my best to bring print to life. Not so difficult as Elaine and her story leap off the page unaided. When I’d run out of voice there were informed and appreciative comments and questions from the audience. And – as often happens at these events – a sprinkling of people with intimate knowledge of the subject through family or other contacts. One chap made a bee-line for me afterwards to tell me all about his mother – an agent with F Section, sent into France – and show me her memorabilia. He omitted to tell me her name – just her codename! Then a long queue of people with books to sign. Fiona was thrilled that she sold every single copy in stock – even the one on display in the window. This, apparently, is unprecedented! So, pretty much a triumph all round. Thank you Fiona for your tremendous support for us local authors, and thank you to everyone who came, especially my dear Sis who made the trip from the Isle of Wight specially to be there. Madden relatives in Australia and Canada who’d helped me so much in my research were, I know, there in spirit. 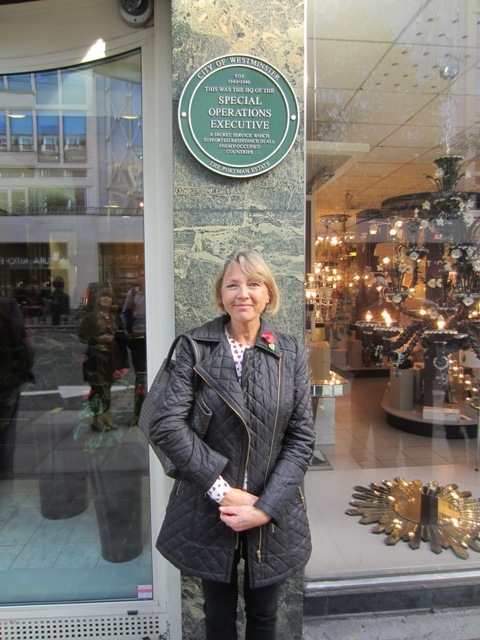 Appropriately enough for October 31st, I spent much of the day talking about spooks and secrets at a special lunch in central London for people interested in or connected to the secret services – especially those active during WW2. 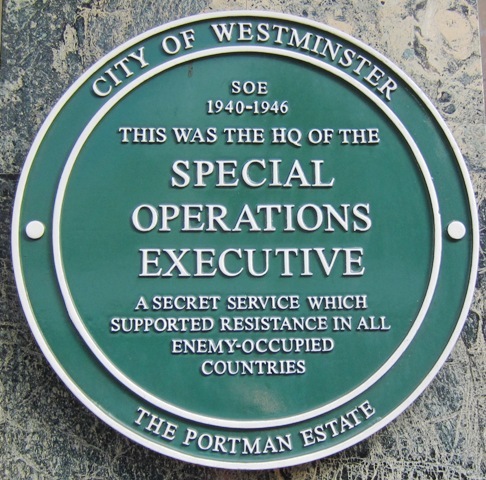 We met at a discreet hotel a stone’s throw from 64 Baker Street – original home of the Special Operations Executive (SOE). These days an anonymous office block, a green plaque betrays its wartime past as the hub of planned sabotage and subversion in Nazi-occupied Europe between 1940 and 1945. Then back to the hotel for lunch and some serious networking. A fascinating range of people were in attendance: a sprinkling of elderly SOE survivors, relatives, experts, academics, writers and knowledgeable amateurs fascinated by this secret world hidden from the public for so many decades. Here I was able to talk about ‘my’ agent, Elaine Madden to a very receptive audience and make influential new contacts. A great day. I came away buzzing and with a new biography of top woman spook, Daphne Park. My thanks to Jedburgh expert Clive Bassett for introducing me to people – and for taking the photos! From the giddy heights of Radio 4 to… well, the very local. This week I’m being interviewed by the Hounslow Chronicle and Get West London. Though this seems like sweating the small stuff, I know I shouldn’t turn my nose up at local media. Any attention is welcome in a world stuffed with shouty people clamouring for print and online space. If it results in a single sale it’s worth my while. Perhaps more important to me than (even) sales at the moment is the response I’ve just had from some of Elaine Madden’s living relatives in far-flung parts. Cousins in Australia and Canada who have followed the progress of the book with interest and helped me with photos and family information have at last had the chance to read it and let me know what they think. This is always a tricky moment. We all have our own idea of how a certain character in our lives should be portrayed. Does a biography enhance or destroy that image? Luckily, they loved it, all of them saying unprompted that they felt they learned so much more about her and the times she lived in. And they also said something else that surprised me: that they didn’t realise before reading it what Londoners (and indeed ordinary people in the UK and Europe generally) went through during the worst of the Blitz and WW2. We take it as read; but it’s new to so many others. To be interviewed on BBC R4’s (I want to say ‘iconic’ here, but it’s such a cliche) Woman’s Hour is both an honour and an ordeal. You feel so much more exposed on radio than telly somehow… and a live interview first thing on a Monday morning gives you the whole weekend to worry about whether you’ll fluff it. I’d done one before, on The Children Who Fought Hitler, but that was pre-recorded so any fluffy bits could be edited out before broadcast. This was The Real Thing. But there’s something about entering the portals of Broadcasting House – the original entrance under the Eric Gill sculpture of Propspero and Ariel, not the flashy new bit round the corner – that inspires pride. It is our BBC after all (take note John Whittingdale and those who would diminish the Corporation through malice or neglect). From there I and my fellow-interviewees (on vaginal sprays, as it happens) were taken into the competent and comfortable embrace of the WH team where, in the Green Room we were greeted by presenter Jane Garvey and told the running order. Vaginal sprays were on first. I was on last, so I had another 40 minutes or so to listen to a packed edition and admire Ms Garvey’s skill and professionalism in handling so many disparate items with humour and an enviable light touch. Radio Times Festival – we were there! 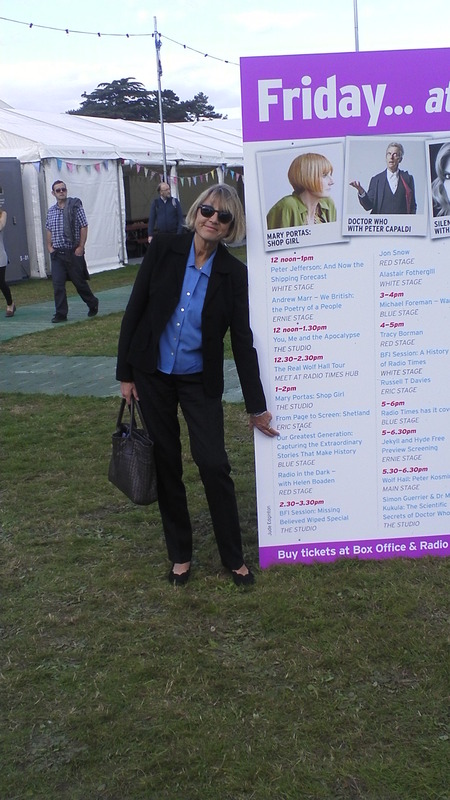 Venerable listings mag Radio Times launched its very first TV/Radio/Book festival this year 24-27 September in the grounds of Hampton Court Palace – and we were there! … but on the programme! The line-up was starry. Everything from the stars and writers ofWolf Hall to Doctor Who and Call the Midwife. David Attenborough, Peter Capaldi, Brucie, Andrew Marr, Jon Snow, Thomas the Tank Engine, Simon Schama, Phillipa Gregory… The best-known names in British telly and publishing in fact. And Steve and me, talking about Britain’s Greatest Generation and how we rose to the challenge of getting 90 and 100-year olds to tell their stories for the series and the book. But these are quibbles. It was a privilege to be part of such a buzzy and well-organised event. Afterwards we went to sessions with Russell T Davies (writer of Dr Who, Bob & Rose, and the amazing and under-rated Second Coming) and Peter Kosminsky – a hero of mine who directed Wolf Hall and who has been making brilliantly controversial drama-docs for more than 30 years –The Government Inspector, The Promise, Britz, Shoot to Kill among them. Worryingly, both speakers were pessimistic about the future of the BBC and seemed convinced that the Tories are intent on dismantling it out of spite, revenge or pure ideology. We’ve been here before and the Beeb has survived political onslaughts from governments of all stripes. But it is Britain’s most precious cultural asset and events like this that round up so many BBC gems and talents remind us just what we’ve got to lose. I predict a Luvvie – and a public – fight-back. This was the first RTFest – let’s hope it becomes an annual fixture. Popular culture deserves no less. ‘Not Guilty’ launched at London’s iconic gay bookshop – TV to follow!